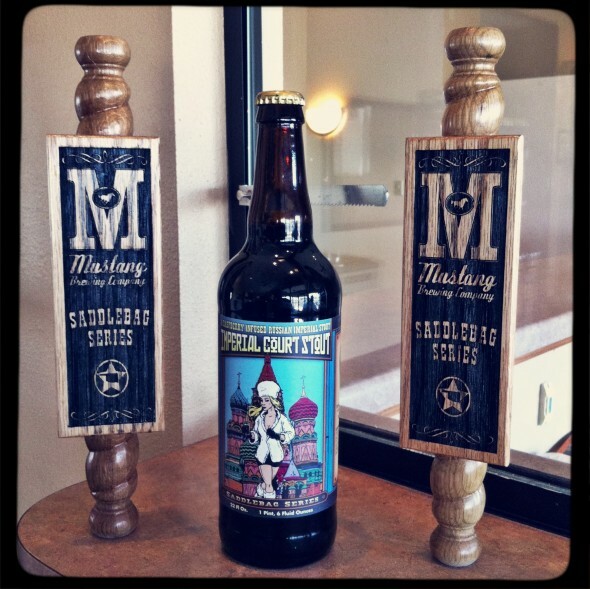 Expect to find the newest addition to Mustang’s Saddlebag Series on tap and by the bottle at select locations. A fair amount of time has passed since last I was tempted to review beer. But given how much I enjoyed Brandy’s Imperial Sundae, the first of Mustang’s “upper-echelon” beers to hit the market, I decided to try out their new Imperial Court Stout. Here’s the deal: I remember quizzing Gary Shellman, the company’s brew master, about the next beer in the Saddlebag Series. He hinted it would be a Russian Imperial-style Stout with a fruit addition. I unsuccessfully tried to needle more information from him, not unlike the lass from Rumpelstiltskin. “Is it cherries?” I asked. “No.” said Shellman with a bit of glee in his eyes. Or perhaps it was the Brandy’s Imperial Sundae we’d been drinking during the interview. “I’m not telling.” He smiled coyly. He chuckled at my fruitless attempts to pry the information out of him. To be honest, I was stumped because I couldn’t think of any other addition that might actually go with a traditionally strong, dark beer like a Russian Imperial Stout. I should have know he wasn’t going to tell me even if I had guessed correctly, which is a huge departure from the fairytale previously mentioned. At any rate, I heard rumblings that this one would arrive in December, but between Mustang ensuring they followed the letter of the law in distributing their stout and purchasing the OKCity Brewing Cooperative in downtown OKC, things seemed like they slowed to a crawl as major changes loomed on the horizon. But here it is at last. And it is certainly different. Appearance: It is deep and dark like a sable, but in the light as you’re drinking it down, you can see a dark purplish tint. I had it in a glass served cold, so the head pours creamy and thick at first. It dissipates within a few minutes, and about a centimeter is left on the surface when it all finally settles. As you slowly empty the glass, there is a bit of light lacing. Smell: The first scent to hit the nose is raspberries followed by hints of chocolate and coffee. It has a tart and delicious smell, that is reminiscent of a raspberry dark-chocolate truffles. Taste: This is the part I find tricky to describe. This is not a sweet beer in the slightest. It is tart up front, but once the taste buds are awash in it, it blooms into this fruity raspberry flavor. Then it finishes off on a bitter citrusy note with a hint of roasted coffee and maybe with a sliver of chocolate on the back end. And I still taste the raspberries throughout. Once this stout warms up, however, the coffee notes are more detectable at the finish. But ever present is that raspberry zing, which plays off the roasted-coffee in a weirdly tangy way. It’s not tart in the sense that it’ll make you salivate, but it’s not mellow by any means either. Mouth feel: The bottle I sampled from was very carbonated. Even so, this is not a chewy beer. It’s about medium bodied, which is kind of light for the style. 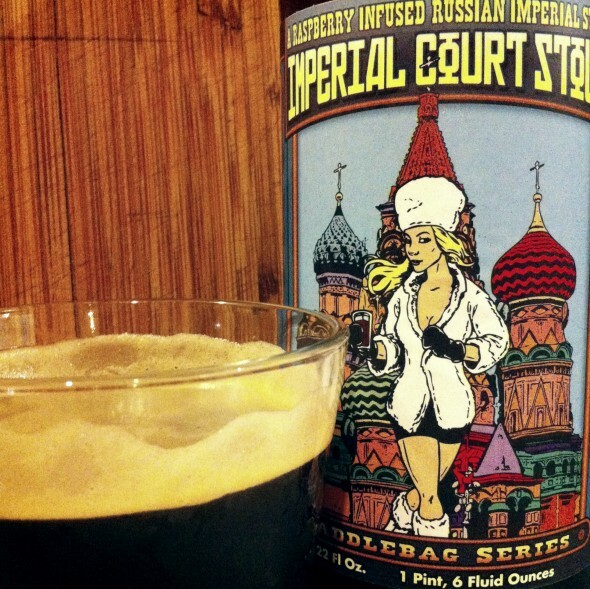 Typically Russian Imperial Stouts are thick and tend to have a velvety texture. The Imperial Court Stout had a more effervescent feel, which I think owes to the high level of carbonation and the raspberries, as it kind of makes my tongue tingle with that fruity tang long after the initial sip. Overall: Ok, I tried this at Firkin Night at McNellies in Midtown last Friday and had not been impressed. Now in fairness, that was a different batch and it was not nearly as carbonated. My tasting notes from that sample read “medium carbonation.” And the finish on that one was more abrupt like grapefruit and coffee, and was sharply alcoholic. However the bigger batch, which is the one being distributed and the one I’m reviewing, is a bit different. The raspberry is more pronounced and the finish is smoother. I’d like it more if it finished with pronounced chocolatey-espresso note instead of a tangy dark-roasted coffee with barely a hint of chocolate. Overall it is fairly enjoyable. I think it is best once it has had a chance to warm. Severed cold right out of the fridge doesn’t really let its flavor profile bloom. Conclusion: I’m giving serious consideration to buying a bottle to age, which is something you can do with these high ABV beers for about a year or two. It’s not as though I don’t appreciate the raspberries, but I kind of wonder what it would taste like if the tarty zing is taken down a few notches. I think it would meld with those dark roasted-coffee flavors a little better. All said, I think people who are turned off by a cloyingly heavy-bodied beer will probably appreciate the lighter body of Mustang’s take on a Russian Imperial-Style stout. If you’ve ever had a Yeti Imperial Stout, then you know what kind of thick, velvety richness it has. This beer is not that. And it would probably not go over well for someone who is expecting less raspberry and more espresso to dark chocolate. So the appeal of the Imperial Court Stout would be in that tart raspberry zing you get up front and in the middle, which then slowly transforms into that roasted-coffee flavor. Now it does stick with you long after you’ve sipped, but I don’t know that I would call it cloying. It’s not a heavy, rather it’s like this light tartness that’s bouncing around your taste buds. To be honest, I’m still getting used to the finish. It’s an unfamiliar kind of tangy bitter. All said, this beer is very different from anything else I’ve tried in the past few months. Curious and want to try it? I’m told by Mustang’s “Beer Ambassador” Chris Anderson that the locations where it will be available on tap are: McNellies in Norman, OKC, and Tulsa, and Tapworks. 10 ounces is expected to retail for $8.00. Anderson said it can be purchased by the bottle at the following liquor stores: Fenwick in Edmond, Byrons in OKC, Broadway Wine Merchants in OKC, The Cellar in Norman, Quicker Liquor in Moore, and Joy’s Liquors in Yukon. Pricing may vary by location. At 9.6% ABV Svetlana will warm you up with her tarty Russian charms. Tagged ABV, Appearance It, beer, Brandy Imperial Sundae, Broadway Wine Merchants, Imperial Court Stout, Mustang Beer Ambassador Chris Anderson, OKC, Type Raspberry Infused Russian Imperial Stout, Typically Russian Imperial Stouts. Bookmark the permalink.